Chiang Mai is a Northern Thailand province located some 700km away from Bangkok, Thailand’s capital. The locals refer Chiang Mai as the Northern Capital and it is Thailand’s second city with a population of about half a million. Located within a South East Asian country, Chiang Mai enjoys a tropical climate. The best weather is found during October – February, Thailand’s winter time, when humidity is minimized. But it can be enjoyable at any time of the year. October to February: Best time to visit, as the weather is milder and nature is at its most beautiful. March to April: Very hot, with temperature sometimes reaching over 35°C. The Songkran festival (Thai’s New Year) fell in April. May to September: Not too hot, cloudy and rainy. Chiang Mai is a 13th-century ancient city of the Lanna Kingdom with over 700 years of history. In here you will certainly see the spiritual side of Thailand, as there are over 300 Buddhists temples in the city. Chiang Mai is a city of culture and tradition in transition. It has a distinct culture (of the Lanna Kingdom), with more temples than any other cities in Thailand, and has a lot of historical sites including portions of an old city that are still intact. Songkran (Thai New Year) and Loy Krathong (& Yee Peng) are two important festivals celebrated in Thailand, especially in Chiang Mai. Songkran Festival which is also the traditional Thai New Year (aka Thai water festival) fell on April 13 to 15. Loy Krathong is celebrated alongside Yee Peng (the lantern festival) and is usually celebrated in the month of November. Lanterns are released into the sky all over Chiang Mai during the night. Read more about 2017 Loy Krathong & Yee Peng festivals in Chiang Mai, which will be celebrated from 2nd – 4th November. Chiang Mai lies in a valley surrounded by wood hills of great beauty. Doi Inthanon, Thailand’s highest peak reaching 2,565 metres (8,415 ft), is located in Chiang Mai province and it is actually part of the Himalayas. With over 50 national parks, Chiang Mai is indeed a paradise for those who enjoy the outdoors. There are over 50 elephant sanctuaries in Chiang Mai & other Northern Thai region. These elephant sanctuaries is a major tourist attraction to the foreign visitor and the locals. Thailand current population of the domesticated elephant is about 2,700. It is estimated that there are 40,000 – 50,000 remaining Asian Elephants in the world and 2,000 – 3,000 elephants remaining in the wild in Thailand. There are at least 10 different hill tribes in Northern Thailand, many of them divided into distinct subgroups. The tribes have sophisticated systems of customs, laws and beliefs, and are predominantly animists. They often have exquisitely crafted costumes, though many men and children now adopt Western clothes for everyday wear. It is possible for tourists to hike through the jungle to discover remote hill tribe villages. Spend time with the tribe hosts and learn about their unique cultures and sleep in the traditional bamboo house. Click here to read more about the major 7 hill tribes in Northern Thailand, namely the Karen, Hmong, Akha, Lahu, Mien, Lisu, and Lawa. Chiang Mai is surrounded by the neighbouring provinces of Mae Hong Son, Lamphun, Lampang and Chiang Rai. Wat Rong Khun (the white temple) is a very popular tourist attraction at Chiang Rai and it is possible to do a day trip visit from Chiang Mai city. The famous Golden Triangle (in Chiang Rai province) is the compact region where Laos, Burma and Thailand meet. Once the world most prolific opium producer, it is now a natural attraction worth a visit. Another popular destination is Pai (in Mae Hong Son), which is only 3 hours driving distance away Chiang Mai City. Inside the one square mile old city moat contains a whopping 34 temples, and the greater Chiang Mai city itself a massive 300 temples. So if temple is your thing, you will be kept busy indeed. Wat Chedi Luang, Wat Phra Singh, Wat Phra That Doi Suthep, Wat Sri Suphan, Wat Suan Dok are among the most visited temples in Chiang Mai. Remember to wear long pants and a top that cover your shoulders when visiting a temple. 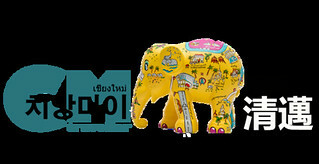 Chiang Mai is truly a shopper paradise as there are both traditional markets and modern shopping malls around the city. Head to the popular Night Bazaar (alongside Anusarn Market & Kalare Night Market), Malin Plaza Night Market, Saturday Night Market, Sunday Walking Street (extremely big), Warorot Market etc, for bargain shopping. For a modern and air-conditioned shopping experience, try MAYA Shopping Centre, Central Festival Mall, Central Airport Plaza, Promenada Resort Mall, Premium Outlet at Kaed Farang etc. Chiang Mai is truly culturally & historically sophisticated, but its real charm lies in the staggering range of tours, treks, courses and activities available. You can easily spend a week in Chiang Mai and do something completely different every day: elephant riding, walking to hill tribe villages, waterfalls, massage, Thai cooking class, mountain biking, rock climbing, bungee jumping, river cruise, unlimited shopping experiences, national parks etc. On top of that, there are fabulous temples, delicious food, unparalleled evening markets and energetic nightlife that cater to everyone. It’s impossible to get bored here. There are hundreds of coffee shops serving amazing coffees around Chiang Mai, be it a large coffee chain (Starbucks, Tom n Tom, Amazon Coffee etc) or independently operated. These coffee shops can be found on busy streets, in the mall, or at more natural settings with amazing forest and mountain views. Chiang Mai is also dubbed as Thailand’s art capital. With numerous creatives taking up residence here, Chiang Mai has become an extremely artistically and visually rich city to visit. There are over 60 Art Galleries, Museums, Artists Residencies, Multipurpose Art Spaces in Chiang Mai alone. Get a copy of Chiang Mai Art Map 2017 (updated annually) when you are in town for a complete guide to current active venues in Chiang Mai art community. There are so many digital nomads choosing to live and work remotely in Chiang Mai due to its cheap cost of living, fast internet speed, good weather and active & strong social network of digital nomad communities. Chiang Mai has repeatedly appeared as No.1 digital nomad hub in South East Asia. The city has more than 10 co-working spaces available, each of which has their own unique vibe. (4) There are international flights departing Chiang Mai International Airport to Malaysia, Singapore, Myanmar, Laos, Hong Kong, Korea, Qatar, and over 10 different cities in China.